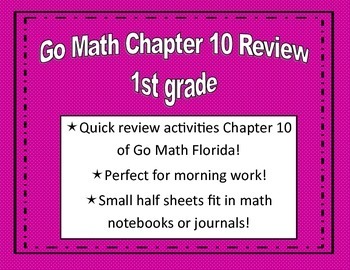 The review activities in this set have been designed to correlate with the Go Math Florida Common Core textbook. 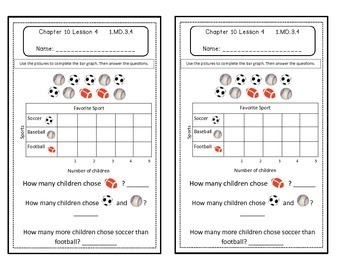 The bundle offers activities for the majority of the lessons in chapter 10 of the first grade textbook. The activities come two on a page for easy copying. Who doesn't like to save paper?! 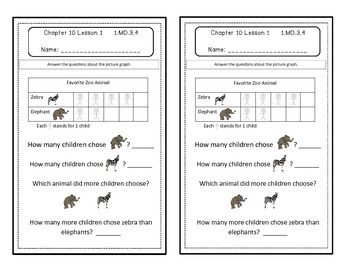 Each lesson includes the chapter and lesson number as well as the correlating common core standard. I have each chapter for sale individually or you can purchase all 12 chapters for $20, which would save you $4!. Please visit my TPT store or at the link below. I created this set to use in my classroom as morning work when the students enter the classroom. Each of my students have a math journal, after completing the activity they glue it into their journal. I go around and check their journals as they watch the announcements. The half-page design fits nicely in the journals. The length of each activity varies depending on the content, but most activities have 4-8 questions. I like to use these to review the previous day's math lesson before beginning a new lesson that day. 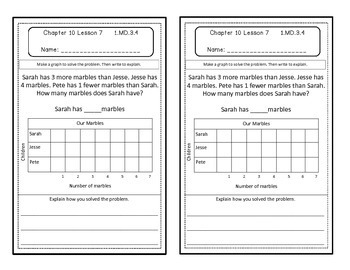 There are many other options for this product other than morning work, such as quizzes, lesson intros, exit tickets, etc. Check out my pre-assessments for each chapter at the link below.